Imagine that tonight, at midnight, you are told that you must make a decision about your very best horse. Your choice is to either have colic surgery performed on the horse, or he will need to be euthanized. You have 20 minutes to make the decision, because he is suffering in severe pain and is a danger to himself and his handlers. There is no certainty as to what the outcome of surgery will be, whether he will survive and return home or be alive in a year. Will he be able to perform at the level that he did before, or will he live a quality life after surgery? You have never even met the veterinarian who is giving you these options. Your regular veterinarian referred you to this equine hospital after 2 hours of treating your violently painful horse in the field to no avail. Should you proceed with surgery, you must provide the surgical facility with a deposit of $3,000 -$5,000. The total cost may range from $8,000 – $12,000, or even more if there are complications. What should you do? In the midst of this crisis, there is rarely enough time for me to tell clients all they need to know. So I felt it was important to describe colic surgery and answer some of the more frequently asked questions. My goal is for horse owners to go into the process better informed. Colic is a sign of disease, not a disease. It is a sign that something else is wrong – it is not the problem itself. The word “colic” refers to the signs that horses show when they are experiencing abdominal pain. This pain usually results from an intestinal condition, but it can result from problems of other organs as well. Signs of abdominal pain (colic) in the horse include: loss of appetite, lying down, pawing, rolling, kicking at the belly, looking at the side, stretching and many others. The horse’s intestinal tract is very complex, about 100 feet long, and made up of distinct anatomic parts, each of which has unique problems that can affect it. There are many different Conditions Causing Colic (CCC’s) that affect each of these different regions. Some CCC’s are simple and often resolve on their own. Examples are intestinal spasm or gas. In fact, more than 60% of horses that experience abdominal pain will either resolve on their own or will resolve with basic medical treatment. The majority of the remainder will respond to intensive medical treatment in a hospital setting. Of all horses that show colic signs, only a small percentage will require colic surgery. It is these horses that are the subject of this article. Your vet’s role is to do the diagnostics necessary to determine a cause for the colic and to determine whether it should be handled medically or surgically. 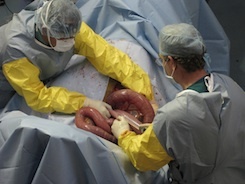 A large colon volvulus – meaning that the large colon is twisted. A strangulation of the small intestine by a fatty tumor on a cord (known as a pedunculated lipoma). An impaction of the large colon, usually a build-up of feed material or sand. A foreign body blocking the small colon. For each of the above diagnoses, there is a specific prognosis and an estimated surgical cost. For example, surgery for some large colon displacement usually has a better prognosis and is less costly than a small intestinal strangulation. One of the most important concepts to understand is that colic surgery is in itself “the ultimate diagnostic test.” Until the surgeon actually explores the abdomen to see what is going on, they cannot give you a definite diagnosis, prognosis, or expected cost. How does the clinician know that your horse needs colic surgery? Horses that are presented to a hospital, after unsuccessful colic treatment in the field, are examined carefully to try to determine whether they can be treated medically or surgically. Here are scenarios that would suggest that a horse needs colic surgery. A specific diagnosis is made and the best treatment is deemed to be surgery. 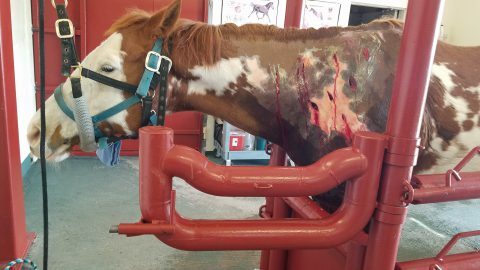 In the absence of a definitive diagnosis, the horse is exhibiting severe and persistent pain, making medical treatment difficult and requiring repeated pain medication and sedation. 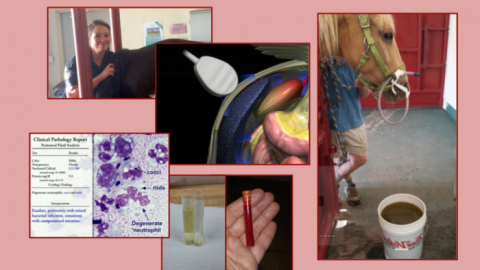 The horse may not look that bad (especially if they have been given pain medication), but all of the diagnostic tests add up to a case that is better managed surgically. Medical management has not corrected the problem in an acceptable period of time. No diagnosis has been made but the horse is still in pain and the only thing left to do is explore the abdomen surgically. The veterinarian who sees the horse in the field must make a quick determination as to whether or not this horse is a surgical candidate. Perhaps the most important part of making that determination is asking you, the horse owner, about whether colic surgery is even an option. In many cases, the only other option is euthanasia. Diagnosis & Prognosis. What does your veterinarian and the surgical veterinarian think is wrong with your horse? How complicated will the surgery be, and what is the likely prognosis if all goes well during surgery? What is the rate of recurrence of the condition? Are you comfortable with all of the risks involved? Relative risk. Colic surgery requires general anesthesia. Modern general anesthesia in horses is much safer today than it was 30 years ago, but there is still a small risk. There are a variety of systems used today to assist horses in recovery from anesthesia, but even so, there is a small risk of injury during recovery. Cost. Can you pay for colic surgery? Is your horse insured? If so, is there coverage for colic surgery? Colic surgery is expensive because it is performed in an equine hospital that has adequate staff, training, equipment and experience to do the surgery correctly, and can handle the intense follow-up care necessary. Temperament. Is your horse a good colic surgery candidate from a temperament standpoint? Temperament of a potential surgical candidate is important. Some of the worst candidates are intense performance horses that simply cannot tolerate being locked in a stall for the weeks following surgery. Age and other conditions. Older horses and horses with other underlying diseases tend also not to be the best candidates for colic surgery. Travel & Convenience. How far will you have to go for this service? Will your horse survive the trip? Stress. Colic surgery is not for every horse owner. Intense colic surgery cases are stressful experiences for horse owners, especially if there are post-operative complications. I tell my clients that the post-operative period in some cases can be a roller coaster ride. Assuming you have been fully advised and have decided to proceed with surgery, the team now prepares your horse for the surgery. He stands in a brightly lit exam room with a team of people gathered around him. Veterinary staff is rapidly clipping the hair from his abdomen. Intravenous fluids pour into his vein through an IV catheter in his jugular vein, attached to a large fluid line that lead to grocery bag sized IV fluid bags hanging above his head. Other staff is busy preparing the surgery room and anesthesia. Your horse is given a variety of medications in preparation for the surgery. Within minutes, he is taken into a small padded room where he is anesthetized and gently lowered to the floor. A large endotracheal tube is placed into his windpipe to keep his airway open during anesthesia. 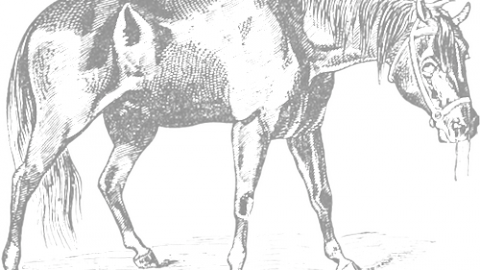 The now unconscious horse has large hobbles placed on his lower legs. These are hooked to a hoist and trolley, and he is transported upside down to the surgery room. He is then placed on his back on a well-padded hydraulic surgery table. He is secured to the table with ropes. 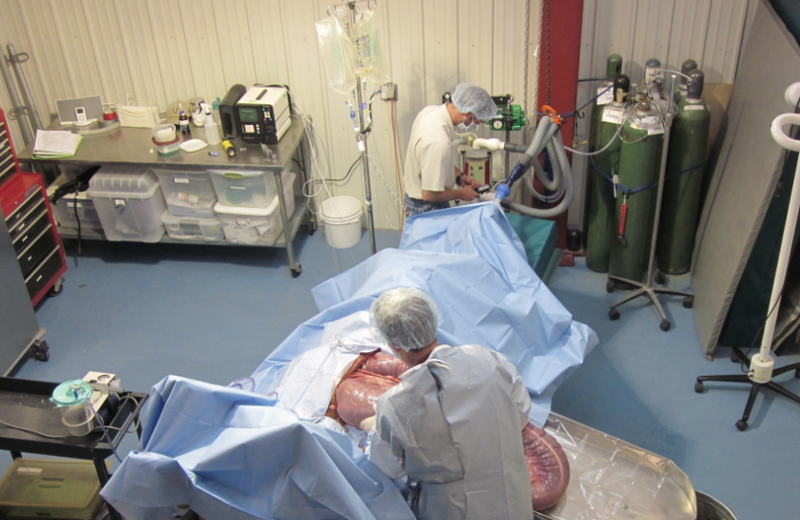 The anesthetist hooks up a large animal anesthesia machine and ventilator to the endotracheal tube. They also set up the equipment that monitors his blood pressure and vital signs. The belly is carefully cleaned and sterilely prepared for surgery. 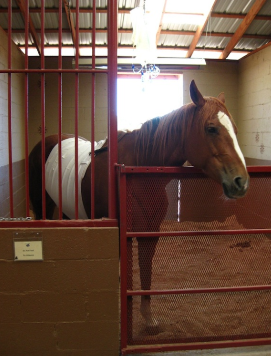 Large drapes cover the whole horse, and serve to isolate the surgical area and keep it clean during surgery. A heavily gowned surgeon makes about a 15-inch incision on the lowest part of the belly. The surgeon and his assistant then explore the abdomen (sometimes shoulder deep) to find the problem. Most of this is done by feel, because many structures of the abdomen cannot be pulled out in plain view. Colic surgery is a very physical undertaking. Heavy segments of intestine must be pulled out of the abdomen and emptied or repositioned. Once the surgeon has made a diagnosis, he or she will usually want to discuss the problem with you. If the problem is inoperable or the prognosis is poor, the decision may be made to discontinue the procedure and the horse may be euthanized on the surgery table. You should be prepared to have this discussion. Once the specific problem is diagnosed, it must be repaired. The treatment depends on the diagnosis, and could involve repositioning displaced intestine, removing damaged intestine, clearing a blockage of feed, sand, or a foreign object, or any other necessary procedure. Surgical time ranges from 1 ½ to 4+ hours. Once the surgeon is confident that the abdomen is free of other problems, the abdomen is closed meticulously with a several layers of suture material, one of which is the heavy holding layer through the strong connective tissue sheet of the body wall. The horse is then returned to the padded stall and assisted in recovery from anesthesia. Once he is steady on his feet, he is moved to his stall. Once in the stall, the horse is often kept on intravenous fluids and monitored carefully. Most horses are on antibiotics and some sort of pain management. Survival rates for many types of colic operations are high, but things can go wrong at any time during this process. Very ill horses may have trouble surviving anesthesia. Horses can be injured during recovery. 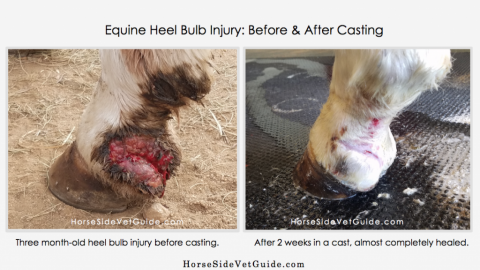 For horses with more severe conditions, the five days following surgery are a critical time and require intense medical treatment and monitoring as well as large volumes of intravenous fluids and other medications. During the first few days, horses are often checked every 1-3 hours (day and night) and monitored carefully for any sign of a problem. The duration of intensive care depends on the condition that was corrected and many other factors. Complications during this period include return to colic pain, abdominal infection, laminitis, colic recurrence, incision problems, and others. For horses recovering normally, the intensity of medical care decreases after a few days and the horse is allowed to leave the hospital 5 to 7 days after the operation. Once home, horses must be confined for about 8 weeks in a small stall and hand walked several times per day. 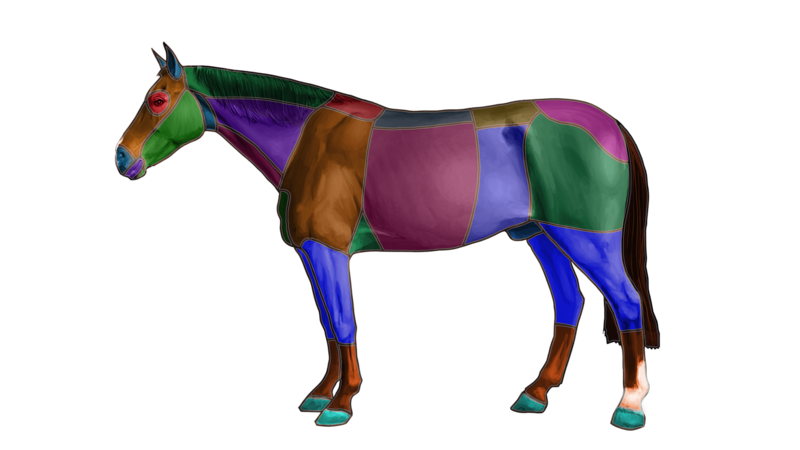 A horse must be kept from moving at speed until the abdominal incision gains sufficient strength to take the weight of the intestines and organs in movement. Diet may need to be modified during the period of stall confinement, and other specific treatment instructions may be given to you depending on the specifics of the case. The prognosis for horses after colic surgery depends on many factors. The most important of these is probably the diagnosis. Some conditions have a high recurrence rate. Studies have shown that a high percentage of horses can return to a performance career after colic surgery, performing at or above their level prior to surgery. Another recent study showed that older horses have a much better prognosis following colic surgery than previously thought. The horse world is full of misconceptions about colic surgery. It is true that 30 years ago, successful outcomes were rare. Since then, though, there have been great strides made in equine surgical and anesthetic technique. Today many conditions carry a very good prognosis. It is possible to invest a large amount of money and hope in colic surgery and aftercare, only to find that the horse suffers from a fatal complication later. Survival to discharge is one thing. Long-term survival is another. Once you have embarked on the path of colic surgery, there is always the concern of “throwing good money after bad.” If things are going poorly, you need to think about when you will stop. Once you have taken your horse to a referral center for colic surgery, the key is good communication with the equine surgeon. He or she will inform you of the risks and prognosis, and help you to make the best decisions along the way. My advice is to have a plan for each of your horses with respect to colic surgery, before being faced with having to make the decision. It is wise to learn as much as you can about the costs, risks and benefits of the colic surgery. Also, it may be wise to investigate the costs and benefits of equine health and mortality insurance. Once you are well informed, your final decision will still have to be made when you are faced with the crisis. In 2011 we made the decision to opt for surgery on our then 10 year old Morgan, Jet, due to colic. He had surgery at the Equine Surgery Center in Sturgis, SD where it was determined that he had a pedunculated lipoma of the small intestine. Six feet of the small intestine was removed. After a lengthy recovery, over 6 mos., he was able to go back on pasture and was acting like his normal self. Unfortunately on Dec. 30, 2015 he once again presented signs of severe colic. We took him to the local vet and left him overnight for observation. Next morning prognosis was not good as he had deteriorated further. Again there was a decision to be made; surgery or euthanasia. We opted for euthanasia on New Year’s eve because we didn’t want to put him through another surgery, etc. It was a very difficult and heartbreaking decision as he was a wonderful horse and just entering his prime. The surgery center in Sturgis, SD is top notch and they did manage to save Jet in 2011 and give us four more years with him but, unfortunately, there are no guarantees. I had surgery carried out on my 5year old. She was in recovery when it was found that the gut had been twisted and the fluid was leaking through the twisted weakened area causing septicemia Therefore the heartbreaking decision was made after going in again a second time within 5/6 hours not to carry on and she went to sleep. We were heartbroken. Troytown Ireland were amazing with the care they gave her. I had to make the decision on my Morgan showhorse twice during his life, for 2 different problems years apart. Both were very succesful. He returned to the show ring to win more blues. He died at age 35 as a result of old age. Never regretted either surgery, and I did not have insurance for the surgeries, only life insurance. Excellent article that accurately reflects this heartbreaking, gut-wrenching situation when having to make an incredibly difficult decision. Been there twice – the first a colon torsion which resulted in a heartbreaking ending despite heroic efforts by the vets and all involved and a second, which resulted in a happy ending. Excellent and candid article.